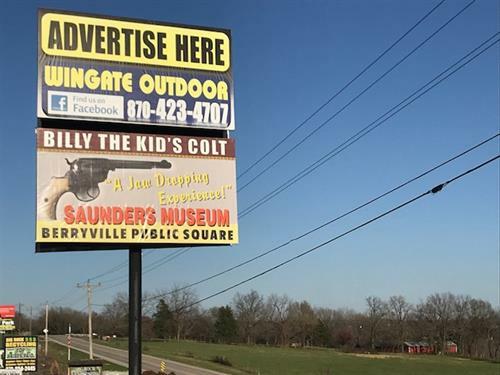 Gene Wingate and his son Ken started Wingate Outdoor Advertising in 1986 to provide a new and cost effective way for local business to advertise directly to their customers in Carroll County Arkansas. Since that time Wingate Outdoor has grown to include sign locations in Benton and Madison counties in Arkansas as well as Barry aned Stone counties in Southern Missouri. Local as well as national advertisers can now reach their customers in Berryville, Green Forest, Alpena, Eureka Springs, Huntsville, Blue Eye, Carr Lane, Shell Knob, Eagle Rock, Gateway, Clifty, Garfield, Avoca, Rogers and Lowell.